This 3.5" Color LCD BoosterPack with Touch for Stellaris from Kentec features a large 3.5" 320 x 240 pixels screen with 256K colours and touch. The BoosterPack is very easy to install on the LaunchPad Stellaris. The major benefit is speed, as the screen uses an 8-bit parallel connection to the Stellaris. Five additional pins are required for the screen. There's no built-in controller for the touch: the Stellaris has to manage the touch resistor directly, through four pins. The BoosterPack is carefully manufactured and very clean. At less than USD35, this screen provides great value. 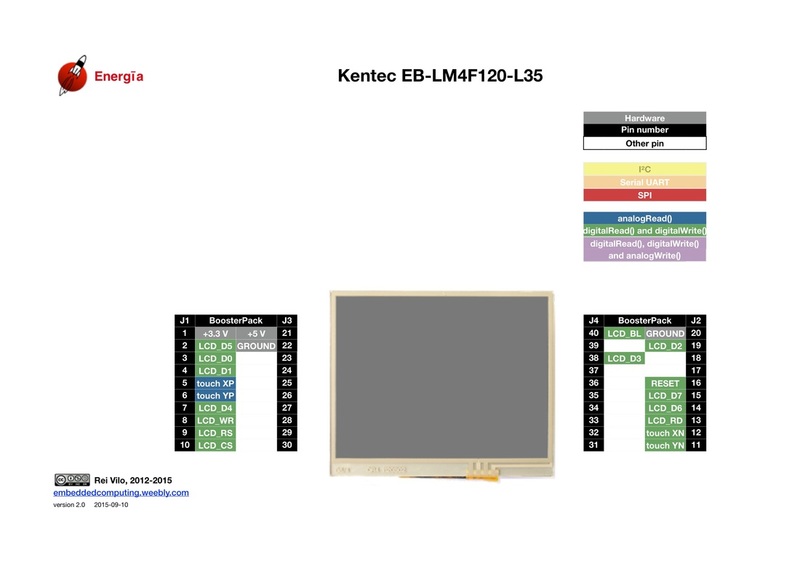 The Kentec page provides all the documentation for the screen. 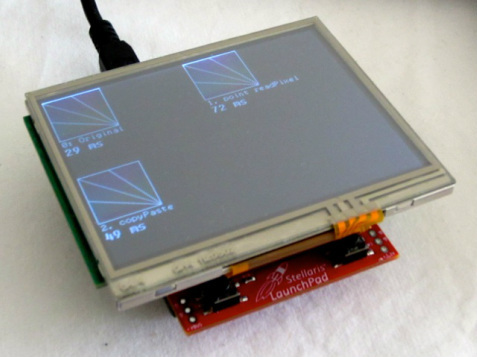 There's a new version of the screen, the Kentec 3.5" LCD SPI with Touch BoosterPack, based on the SPI port. 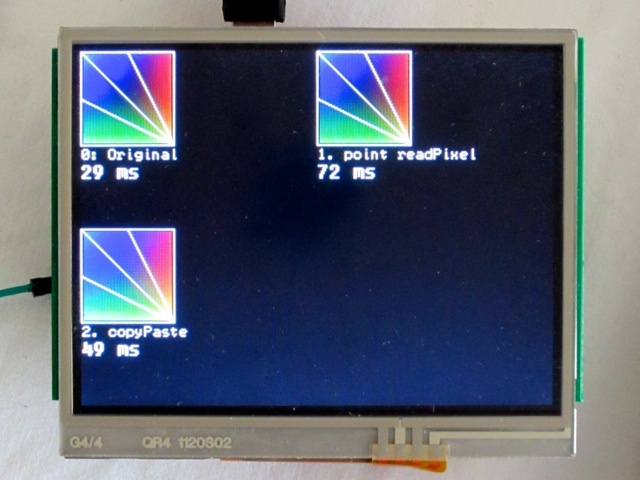 Thanks to its 8-bit parallel connection, writing to and reading from the screen are really fast, up to 10 times faster than a SPI-based screens! Copying and pasting a 64x64 area needs 49 ms only, instead of the 438 ms required by the SPI-connected HY28A. 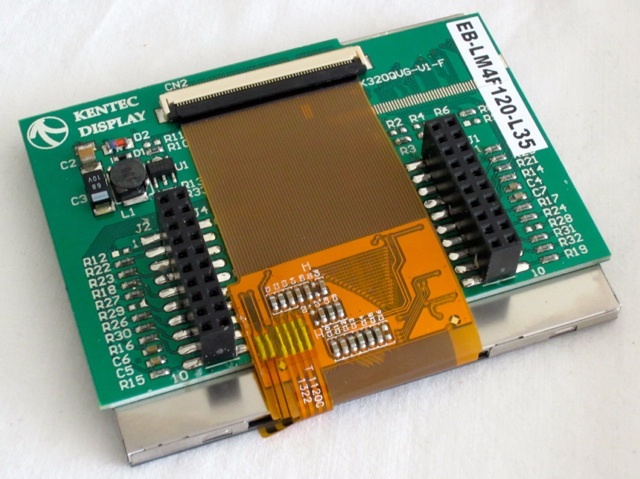 Texas Instruments has a full chapter on its great Stellaris LaunchPad Workshop for the Kentec 3.5" BoosterPack. The Getting Started with the Stellaris EK-LM4F120XL LaunchPad Workshop is a free, in-depth, hands-on introduction into Stellaris LM4F basics. Chapter 10 explains how to use the screen and describes the Graphics Library, a rich library with many features for the Code Composer Studio IDE.